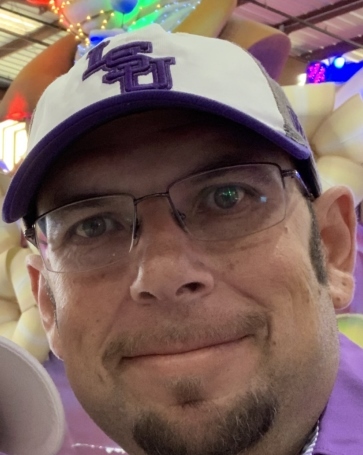 Blake Joseph Gregoire, born May 19, 1973 in Marrero, Louisiana, entered into eternal rest on Thursday, April 4, 2019, after a year-long battle with cancer. A resident of Madisonville, Louisiana, he was a graduate of L.W. Higgins High School. He was an avid L.S.U. fan and a proud member of the Krewe of Endymion. Those left behind to cherish his memories include his wife, Brandy Donovan Gregoire, his three sons, Brock Joseph Gregoire (Justine Gregoire), Bryce Donovan Gregoire, and Brayden Drake Gregoire, his parents Carmen and Vivian Gregoire, his sister Bridgette Gregoire, and many extended family members and friends. A memorial to celebrate his life will be held at Greenwood Funeral Home, 5200 Canal Blvd., New Orleans on Friday, April 12, 2019 at 1:00 p.m. Visitation will begin at 11:00 a.m. In lieu of flowers please donate to the Ochsner Cancer Institute.